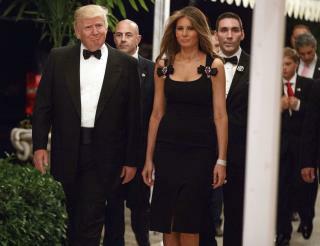 (Newser) – Mar-a-Lago will show 2017 to the door as one might expect: With a lavish red-carpet party attended by Florida socialites looking to hobnob with the club's owner and most famous resident, President Trump. "It’s a very glam night," a club member tells the Washington Post. "I think everyone is even more excited this year than last year, because then he was president-elect, he hadn’t been sworn in. Now he’s president, and he’s accomplished so much already." And people are willing to pay for the privilege of attending what the Post calls "the highlight of the Palm Beach social season": The club, which doubled membership prices to $200,000 after Trump's election, is charging members $600 and guests $750 per ticket. That's up from $525 and $575 last year, notes Politico. Trump deserves gratitude from all Americans for his leadership. Liberals I accept your apology and I forgive you. "Trump" signs around the world have been taken down. His reputation has soiled his brand in foreign countries. No one decent wants to work for Trump as well. Why make yourself a target for an investigation because Donald is crooked?